Now after 2 weeks of bingeing on ice cream, fried seafood and jalapeño poppers, a rich cake was not the first thing I was craving. So my original intent was to bake the cake, photograph it, have a slice, and send it into John’s office. With my apologies to his co-workers, that is not happening. I don’t mind saying that I hit a home run with this cake. The whole family agrees. 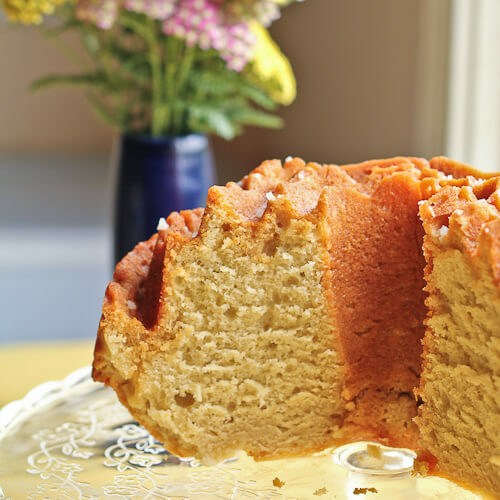 And if you are really interested in caramel bundt cakes, be sure to also check out the Dulce de Leche Bundt Cake I made a few years back. It too was a winner here! 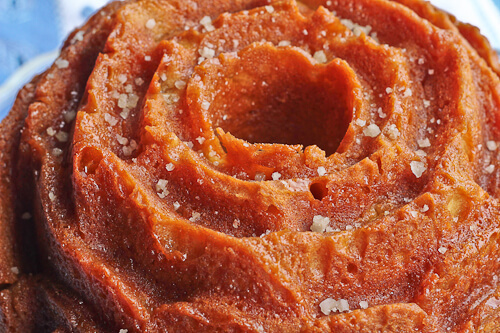 Simple rule: Bake us a bundt using caramel. Post it before July 31, 2013. First make the cake: Preheat the oven to 325 F. Spray a 10-12 cup (with a smaller pan, you may get the rounded effect on the bottom of the cake that I got, from it rising over the edge of the pan) bundt pan with nonstick baking spray. Set aside. In a stand mixer fitted with a paddle attachment, beat the butter until creamy, about 3 minutes on medium speed. Add the sugar in several additions, scraping down the bowl inbetween, and beat until the mixture is pale and fluffy. Add the eggs, one at a time, scraping down the bowl after each addition. Add the vanilla extract and paste and beat to incorporate. Whisk together the Tuaca and yogurt. Add the flour mixture and the yogurt mixture to the batter, mixing on low. Add in 4 and 3 batches, respectively, beginning and ending with the flour mixture. Beat on medium-high speed for 20 seconds. Scrape the batter (it will be stiff) into the prepared cake pan. Smooth the top with a spatula. Bake the cake for 50-60 minutes. The cake is done when it is golden brown, pulling away from the edges of the pan, and a cake tester inserted into the center of the cake comes out clean or with just a few crumbs attached. Remove the cake from the oven and allow it to cool in the pan for 10 minutes. Invert the cake out onto a cooling rack lined with parchment paper. Let cool for one hour. At the 45 minute mark, make the butterscotch glaze. Melt 1 cup of sugar and the agave syrup over medium heat in a heavy saucepan. Stir until dissolved. When the mixture is clear, stop stirring and let it boil untouched. Cook the sugar until it is deep amber (if you have a candy thermometer, about 300 F). Slowly drizzle the water into the caramel--stand back as it will bubble up. Stir to incorporate. Turn the heat off and add the butter. Whisk to incorporate until the butter is melted and mixed in. Mix in the salt. You will have more caramel than you need. Drizzle as much of the butterscotch glaze over the cake as you want--I used about half of mine. Try to cover all of the outside (the shape of the cake will affect this). While the glaze is still warm and sticky, sprinkle the outside of the cake with coarse sea salt. Let the glaze set and the cake cool completely before slicing. You crack me up, Laura! I’ll bet the office folks will be very sorry if they see this. What a great cake! I had never heard of Tuaca so thanks for the link. Vanilla citrus liqueur sounds like something I would love! I’ll be looking out for it now. I don’t think i”d be able to part with this either! That salted caramel butterscotch flavor and I would be inseparable. I love this! so, I take it you left the entire thing at home and you and the family ate it all?! that truly means it was delicious . . when you can’t part with it! love this! We kept it at home and it is long gone already! Serious wow! I’d have trouble letting go of this one too!! Ha! I’ve done the same thing before too– planned on sharing then kept it all at home. That is a true sign of a delicious cake– well done! I am curious about the use of greek yogurt. I have some in the kitchen now and hadn’t thought to bake with it. I’ll give it a try, thanks! Anyone in John´s office who reads your blog won´t be happy… this is gorgeous, and I had never heard of tuaca liquor! 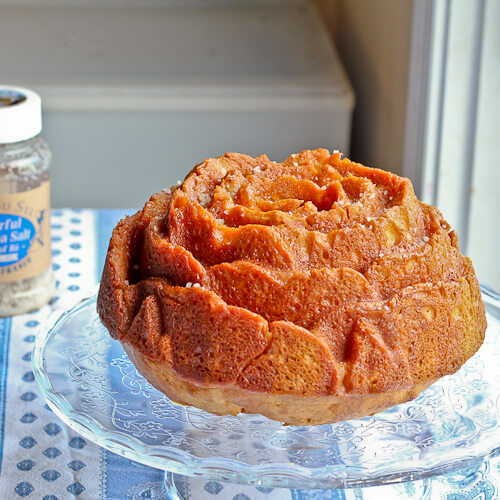 I love that rose bundt pan. I have one just like it. Your bundt looks amazing. I love butterscotch caramel. Whoa! This sounds amazing! Love the butterscotch caramel glaze. i wouldn’t mind giving up chocolate forever if i was assured that i’d be able to eat butterscotch or caramel in its place. i love those flavors! 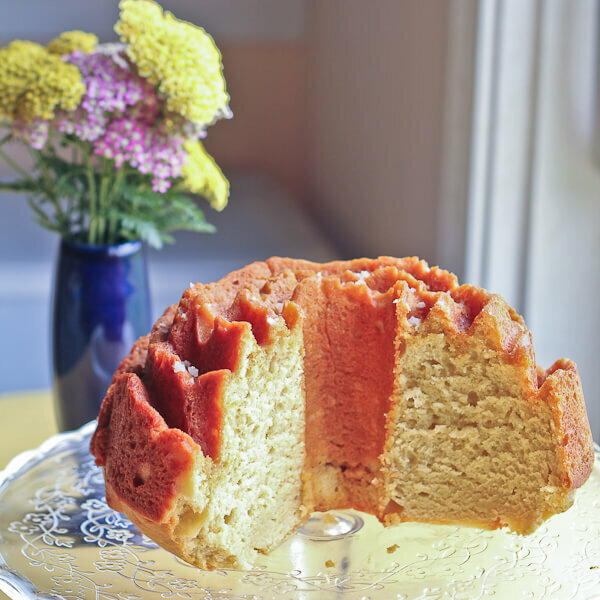 LOVE this bundt cake shape–and your combination sounds delicious! The flaked salt on the top is just perfect. I love the flavour combination of this cake, it must of been delicious.